Pineapple goes with fresh pork as well as it does with ham. The classic combination of two different tastes working together for maximum flavor. 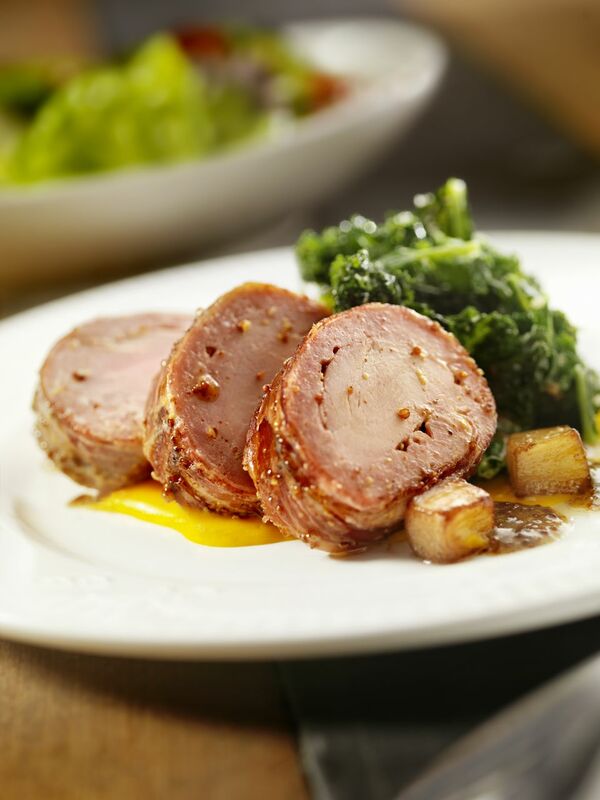 The acidity of the pineapple cuts through the richness of the pork, creating the sweet and savory classic flavors. This pineapple sauce is a quick and easy pan gravy. Some boneless pork loin chops can be a bit tough to the bite. This recipe calls for the steaks to be 1 1/2 inches thick. If you can't find this size at your grocery store, any local butcher shop can cut the meat to your specific needs. To avoid any toughness, simply place between sheets of plastic wrap and lightly pound with the flat side of a meat mallet to tenderize. Reshape and proceed with the recipe. If you are using fresh pineapple, be sure to reserve the juices as you cut the pineapple, and enjoy the leftover pineapple fresh as-is or in other recipes, desserts or cocktails. And remember, pork can be cooked and served medium doneness (145 F). This recipe is relatively simple and you can have this on the table in less than 30 minutes, making it a special weeknight dinner. This recipe pairs well with a simple rice or mashed potato. You will want a side dish to soak up the sweet and savory pineapple sauce. If you have any leftovers, these can easily be reheated and enjoyed as is, or even on a sandwich the next day. Sprinkle pork loin steaks on both sides with kosher salt and ground chipotle chile pepper. Heat a heavy deep skillet over medium-high heat. Coat bottom of the pan with olive oil. Sear pork loin chops until browned on both sides, turning only once. Remove the chops to a platter, and keep them warm by covering with foil. Alternately, keep the pork in a warming drawer or oven on low. Lower heat to medium and melt the butter in the pan drippings. Add the sweet onion and saute until golden, stirring often. Add the garlic and cook 1 additional minute. Carefully pour in the wine and deglaze the pan, scraping up and reserving any browned bits. Simmer until the wine is reduced by half. Add the chicken broth, pineapple, and cinnamon. Cook, stirring often until most of the liquid has evaporated and sauce is thick. Taste and adjust seasonings. Return pork loin chops to the pan, turning to coat with the sauce, and cook until chops are heated through. Do not overcook or the pork will become dry and tough. Serve the pork loin steaks with the pineapple sauce.